If dry bread is your thing, then you’ll want to skip this recipe. 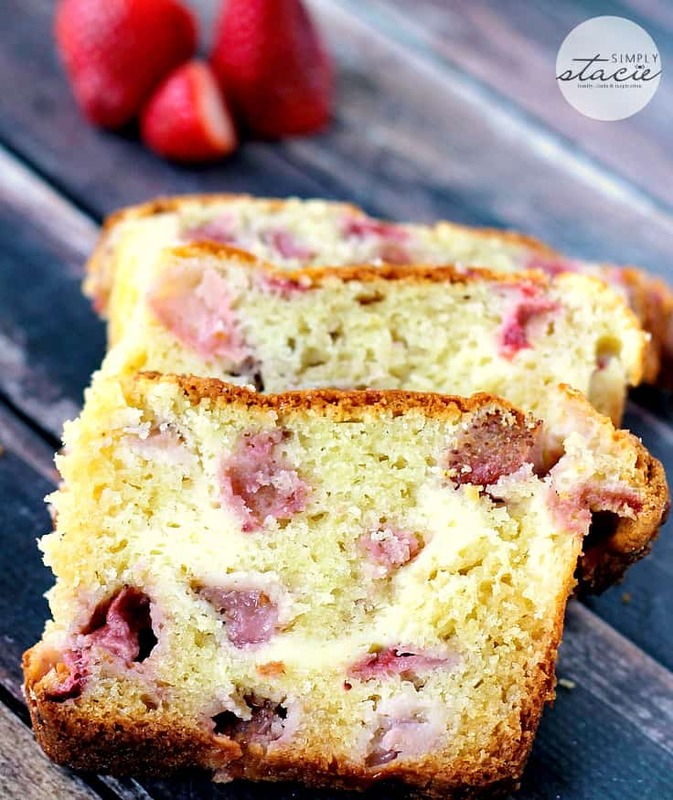 This Cream Cheese Stuffed Strawberry Bread is a super moist, melt-in-your-mouth kind of recipe! I prefer the latter, hands down. Snack or dessert, it doesn’t really matter. It tastes yummy on its own or serve it with some vanilla ice cream. This recipe is a keeper! The peak season for strawberries in Ontario is in June and July. We often pick berries in the summer and then make a recipe with our day’s work. Bridget adores strawberries so I buy them year round. For more strawberry recipes, try these ones from my blog: Strawberry & Coconut Breakfast Casserole, Strawberry No-Bake Cheesecake, Berry Cheesecake Trifle, Strawberry Agua Fresca and Berry Jam Smoothie. Have you ever made strawberry bread? In the bowl of a stand mixer, add ¾ cup sugar, 4 ounces cream cheese, and ½ cup butter; beat on medium until fluffy. Add eggs one at a time, beating well after each one. Add vanilla and heavy cream; beat to combine. Remove bowl from stand mixer. Add 2 cups flour, baking powder, baking soda, and salt to the bowl with the wet mixtures; Fold in with a spatula until just combined. Place strawberries in a small bowl and sprinkle ½ tbsp flour over the top; toss to coat. Add strawberries to batter and gently fold in. Do not overmix. Set aside. In a medium bowl, add 4 oz cream cheese, ¼ cup sugar, 1 egg, and 3 tbsp flour; whisk or use a fork to completely combine (no lumps); set aside. 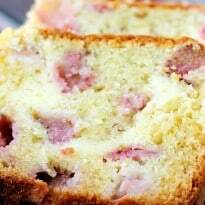 Using a 9×5 loaf pan, spray with non stick spray, add ¾ of the strawberry batter to the pan; spread evenly. Pour cream cheese filling mixture over the batter; spread evenly. Carefully add the remaining batter to the top, pressing very lightly to spread (you don’t want it to mix a lot with the cream cheese filling), until the cream cheese layer is covered. Sprinkle 1 tbsp sugar over the top, place in oven; bake for 50-60 minutes. If you feel the bread is getting too browned partly through cooking, you can tent a piece of foil over the top. Check bread with toothpick at 50 minutes. When the toothpick comes out without batter on it, the bread is done (this is a little difficult because the cream cheese won’t get hard – but check for batter not cream cheese). Remove from oven and allow to cool in pan for 30 minutes on a wire rack. Remove from pan and allow to cool completely on a wire rack before slicing to serve. Enjoy! Store wrapped tightly in the fridge. If you use mini loaf pans, make sure to only fill 3/4 full, otherwise it will be a BIG mess. That looks so delicious! It’s making my mouth water! Looks so good! I am definitely going to have to try this recipe once the strawberries come into season! This looks amazing! I love strawberries so much. I can imagine this would be a awesome springtime party food. This recipe looks so good and I just printed it out to try soon. Anything with strawberries is always welcomed in my house. I love that you used cream cheese in the recipe. I’m with you, I can’t do dry breads. Definitely wouldn’t last in this house! Mmmmmm, nothing better than cream cheese and strawberries, this looks so good, with vanilla ice cream and a drizzle of strawberry glaze, yummmm!!! Oh my! I just printed this out! I have got to try! It looks and sounds delicious! Oh gosh this looks so good – a have to make soon! Oh heavens my taste buds went nuts!! I had to pin this gem of a find for later … yay strawberry season!! Do you have a no cook strawberry jam/freezer jam recipe?!? I noticed how moist and delicious this looks. I have noted the recipe and I an having a party a week from Saturday. I am going to try his out. Oh my goodness I have to make this it looks and sounds so yummy. This looks so delicious! I can hardly wait to make it. 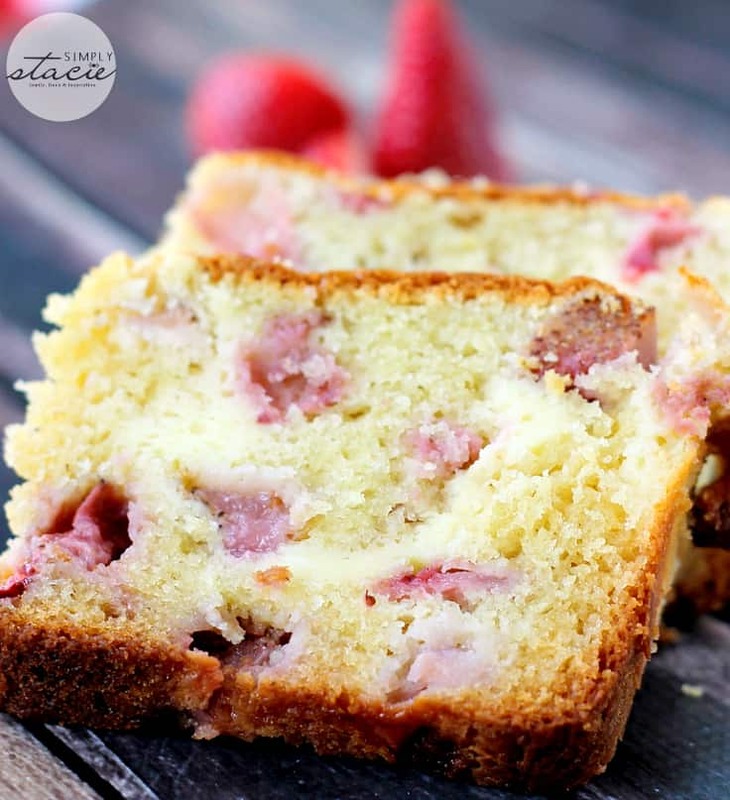 I’ve never heard of strawberry bread before, but after seeing it, definitely need to try it! Looks so good. I have to make it. My mouth is watering just looking at the photos! This sounds amazing. I am definitely making this soon! 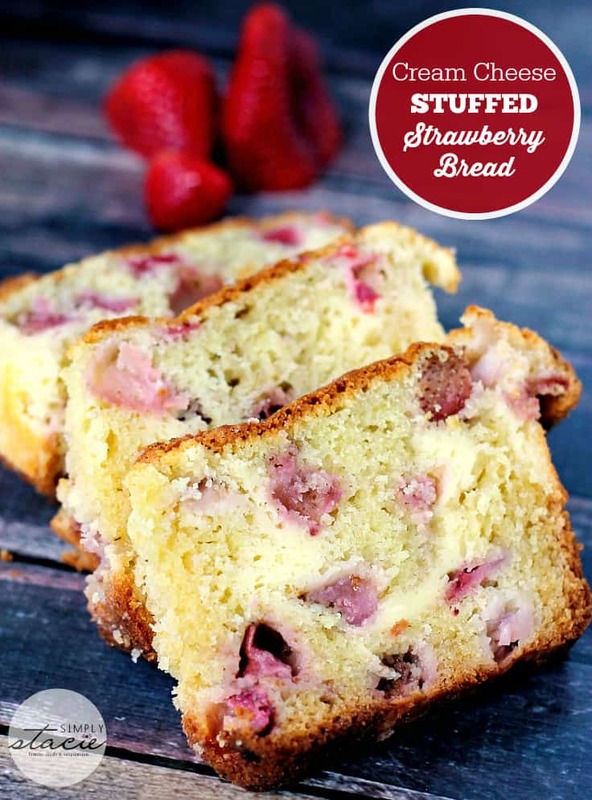 I love the sounds of this – Ive never tried a strawberry bread before. This strawberry bread looks very good. It looks like it would be easy to make as well. Thanks for sharing. OMG! No I have never made Strawberry Bread before. But I will be after seeing this! 😀 YUM! A must try for sure! This looks so delicious! I like anything with cream cheese! I saw this recipe the other day, and it looked amazing. I made sure I had everything I needed. The only thing, when I was following the instructions, where does the 1/2 cup cream or milk come into play?? I hope it went into the wet batter, because that’s where I put it. What did you find out about the cream? Did it come out okay? I love anything strawberry or cream cheese, so I know this would be heavenly. Especially with some ice cream like you suggested! I could live on that alone I am sure of it! Oh, yummy! I’ll be trying this for sure! Yum! I have never made strawberry bread. Is this really a bread? It looks like cake to me. and I can’t wait to try it. Thank you for sharing this recipe. I have never hear of strawberry bread before but it sounds good. My husband loves the strawberry bread from Walmart’s bakery, but I bet this tastes so much better ! I’ll definitely be giving this a try! Can’t wait!! I like the idea of cream cheese and strawberry, my grand children would love to eat. I will replace egg.# Miz Helen. I have linked Poppy seeds Halwa. Nice to meet you in the journey of blogging I live in Calgary Canada. Not only does that look absolutely delicious but your photography is really amazing too! 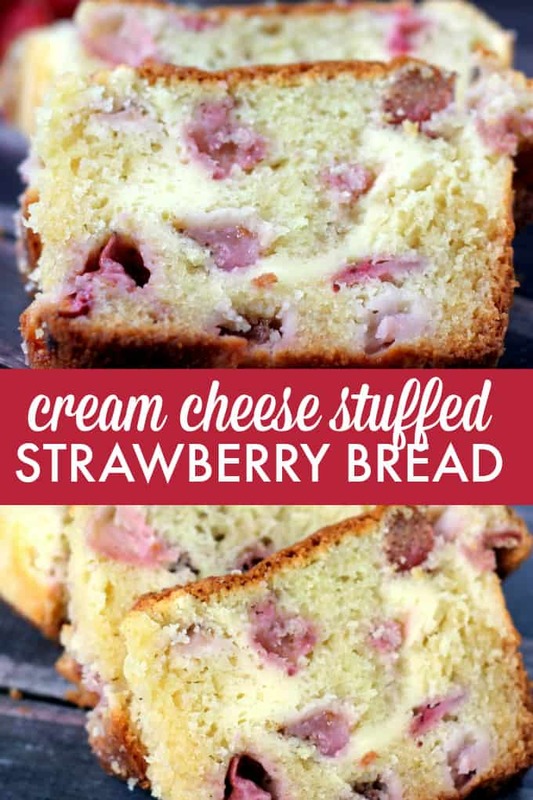 Your Cream Cheese Stuffed Strawberry Bread looks amazing! Hope you are having a great week and thanks so much for sharing with Full Plate Thursday. You can put cream cheese in bread?! Now why didn’t I think of that?! I must be missing something. I have reread this recipe multiple times and don’t see where it says to add the cream/milk. I made it to the end of the recipe and realized that it hadn’t been added. This recipe does not look very promising. The batter is super thick. This is in the oven right now….we’ll see how it turns out.